The Steel Detailer contains a lot of smart ways of making your projects run faster. Imagine having all of your steelwork BOM automatically filled. Never to type them in again. By making components excluded from the BOM that are only used as guides for creating connections, you can hide components and remove them from the BOM at the same time. 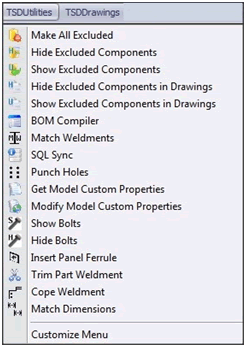 Hiding components from the assembly that have been excluded from the BOM gives the user the ability to control connections with hidden components. The ability to select open with not loading hidden components helps with large model handling. Hiding Components that have been excluded from the BOM in drawing views allows the user to create templates of drawings for member library models. Currently with solidworks there are two distinct BOM'S. A standard Assembly BOM and a cut list for weldments. The BOM Compiler goes through the project and gets weldments in a single part and copies the section cut list data to the part custom properties to fill in the Assembly BOM. Solidworks gives the basic weldment select and insert, but nothing to make two weldments identical until now. The Steel Detailer allows the user to select two weldments and match them. This is a really good tool if you are matching connection weldments with member weldments. The SQL Sync syncs between the SolidWorks Area Assembly and the database. This automatically runs after the mouse has been sitting idle for 10 minutes. By selecting the back of a plate and the opposite side of a mating part or another plate the punch holes function does just that by converting entities in-context with the mating member, punching all holes. If the plates hole centres change or the hole sizes change, so does the mating part due to the in-context relationship. There are a myriad of marking systems out there and this function helps deal with that. By naming your own field or use the default field ‘MARK’ a user can set their own marking system within the SolidWorks parts and assemblies. Instead of opening a part from the custom properties and then going to the parts custom properties, simply select the part inside the assembly and update the parts custom properties using the get model custom properties. All bolts that are virtual components are shown. Be careful using this on a large assembly as it may take a while. All bolts that are virtual components are hidden. Just like show bolts, be careful using this on a large assembly as it may take a while. This feature matches the holes on the part that is connecting to the component to which the bolts need to be inserted. This feature is used to trim in a member to another. This feature uses a plane in-context of the part to which Assembly the Part is defined in. Allows trimming of two members, similar to a weldment trim used in weldments. The difference is that this is a part level feature used at Assembly level and allows clearance. This feature allows the user to match a changed dimension by selecting a parent part Assembly then by selecting the part that the dimension are to be updated.